Komodo Habitat Dial Thermometers are designed to help you measure and monitor the temperature in your reptiles home. Temperatures in vivariums and terrariums can alter easily for many reasons, for example if your room temperature changes. Using a thermometer will help you spot this change. The Komodo thermometer needs to be placed inside your terrarium or vivarium and exactly where you want to measure the temperature. Analogue thermometers are great for enclosures with high humidity as they will still work in humid environments due to their fog resistant seal. 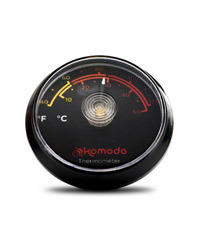 The Komodo Dial Thermometer gives accurate readings in degrees Fahrenheit and Celsius and attaches easily with sticky back tape included. Most species require a heat gradient (usually a warmer end of the enclosure and a cooler end). If you are creating a heat gradient then it will be useful to purchase two thermometers so you can monitor the temperature at both ends of vivarium or terrarium.